Don’t order the muffins with your continental breakfast at the Bates Motel. The chef has included a special ingredient; just ask little Emma. While Norman is planning something nasty for Bradley, Dylan may have risked his life in helping her find closure over her father’s death. Mr. Abernathy wants his money and he wants it now! Sounds like a JG Wentworth commercial to me. Norma doesn’t have it. Who does? Find out after the jump. Norma is scared and goes to Sheriff Romero for help. He tells her, “Don’t worry; be happy.” But the Sheriff is a little sneak and he’s knows more than he’s letting on. Norma isn’t happy and asks Dylan to get her a gun. She wants to protect herself. Dylan’s response, “You and a gun is a bad idea.” You think! 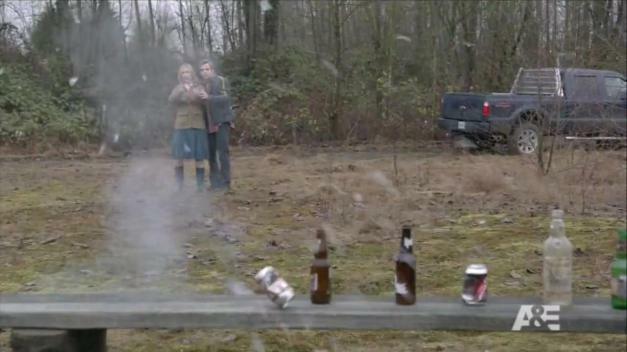 But Dylan relents and gets Norma a gun and teaches her how to use it. Why would he put a gun in her hands? He does and she shoots pretty well. She likes her gun; watch out world. We get glimpses of Norma’s childhood when she visits Dr. Fumhero Kurato (Hiro Kanagawa). She’s stressed out and scared of Mr. Abernathy. The good doctor asks Norma about her childhood because we all know that something is very wrong with mother dearest. Norma is repressing some bad memories and rushes out of the office. While Norma is cleaning the motel rooms, Maggie Summers (sporting a black eye) comes to warn her; Abernathy is a bad man. Maggie is Keith’s sister and the bookkeeper for the human trafficking business. Bradley stops by to get her father’s personal stuff from Dylan; Norman is jealous. Emma stops by to show Norma her new dress and Norma finds out that Emma and Norman are going to the school dance. Norma is afraid that Abernathy will kill her and tells Norman about her childhood; father violent; brother raped her. Why would you tell your teenage son this stuff? 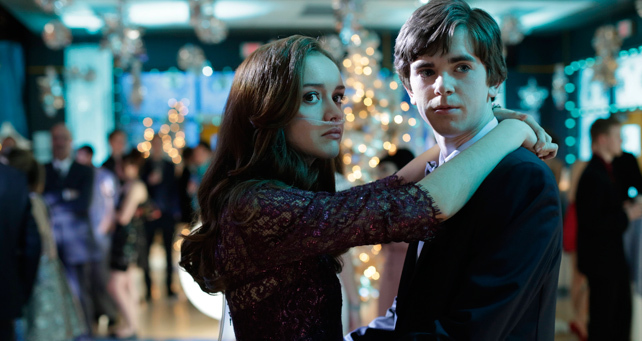 Anyway Norman, who’s now dazed from his mother’s revelations, goes with Emma to the dance. Norman was so rude to Emma at the dance! I’m glad that Bradley’s boyfriend punched him. The Teacher was hitting on Norman. Miss Watson (Keegan Connor Tracy) is a pervert and she’s taking advantage of a boy, who already displays personality disorder traits. When she sees Norman walking home in the rain with a bloody nose, she offers him a ride. Will she take him home? Nope! Naughty teacher takes him to her place and then begins to undress with her bedroom door open. She’s a pig! Most child abusers are known to their victims, and right now, Norman is her victim. Norma is hiding with her gun; she’s waiting to ambush Abernathy at his boat. But the Sheriff has his own plans; he has the satchel with the money. Abernathy wants his money and he wants it now! The Sheriff shoots Abernathy and then throws him and the money in the bay, saying, “Not in my town.” He knew that Norma witnessed the whole thing; tells her to go home. Maybe, just maybe, this Sheriff is honest? Norman doesn’t know what to do when Miss Watson starts disrobing; he gets a little squirrelly; hears his mother’s voice; has a black out. I really like this show. The whole town is crazy and sometimes the Bateses look like the normal ones; sometimes. Mr. Abernathy is gone, but there are plenty of bad people in that town. Who is the big boss? Someone has a grip on the town. Maybe we’ll find out on season two. And before I forget, don’t worry about the teacher; she’s on permanent sabbatical. Well, I finally caught a glimpse of this show and I must say, what a great story. Now I’m stuck trying to catch up with all the previous episodes. As always, great recap and wonderful writing, Marie!